Hello! I posted this under Tunisian Crochet, but as the last post in this section was from April and I'm new to crochet forums, I'm not sure if this was in the right place--I'm reposting this here because I desperately need help! I'm trying to crochet my first pair of gloves (I asked my boyfriend what he'd want me to make him for Christmas and he, of course, chose the hardest thing possible). I found this pattern that I love, and so far it's gone well; I've reached the part where I'm supposed to chain a new section to begin making the thumb. This is where I get tripped up, though! The pattern states, "Ch 9 loosely, draw up a loop in 2nd st from hook and in each st of ch; 8 loops, work pat. until there are 22 loops on hook; work off loops. Work on these 22 sts for 2½ ins." My first issue is that when I "draw up a loop" in every stitch of the chain I end up with 9 loops on my hook, not 8. Not a big deal, I figured that's such a small difference I can work with it, it'd be fine. But with the next part, I literally have no idea what it means. How do I get 22 loops out of 8 (or 9)? Am I supposed to draw these off of the hook first, and then increase in that new section until I have 22 loops? It states that I'm supposed to work on these 22 stitches, so obviously that number is important, but it doesn't give me any instruction as to how to do that. My first instinct was to work the loops off of the crochet hook before increasing, but if I do that it makes a foundation that is significantly smaller than what 22 stitches from the get-go would give me. Why wouldn't I just chain 22 or 23 to start? I've looked online to no avail, and there's no way to contact the creator of the pattern that I can find. You can view the full pattern here Men's Afghan Stitch Gloves Pattern. (I figured once I started that "Afghan Stitch" is either another name or a type of Tunisian crochet; correct me if I'm wrong! Also, it might just be me, but the way this pattern is written gives me a headache--it's just the best I could find without having to knit with a set of double pointed knitting needles, and that seemed harder than figuring this type of pattern out). I'm bolding my two questions just because I know I've written a lot, so hopefully it's easier to read. I'm also adding a series of photos to show how I'm interpreting the first portion of the instructions for the thumb. I feel like I don't even know enough to try and guess around until I figure something out! This is my first time working with this type of stitch, and I've loved working in it so far--if I can just figure out what they mean by this one part, I think I should be able to finish this pattern and make a beautiful pair of gloves. Thank you! Has anyone had any experience crocheting directly onto denim, such as adding an edging to a pair of jeans? I Just bought a couple of pairs of capris, and I don't like the rolled cuff on them. I'd like to cut that off and add a crocheted edge. I'm thinking I probably need to hem them, but then I'd be crocheting through two layers of denim. That doesn't sound so easy on the hands. Any suggestions for how to do this without ruining my capris and my hands? Thanks in advance! I was wanting to know if someone would guide me through a paid pattern By Julie Coco Cocoa Owl Scarf. I am looking for someone that would have this pattern also. I know my stitches. Just with my count, am a bit confused at the beginning of the pattern too. Okay.I was wondering if anyone else that has tried it had the same problem I have had with guage being to small. Well, it's not quite that simple actually. The guage is as follows. 14 rows by 7 bean( 6 loop puff) stitches= 4" by 4". (Lion brand mandala yarn size 3)And of course using the famous size H crochet hook. But it also says, an easier way to guage your project is that your starting chain of 100 equal 27 to 28 inches long. My problem is, when I guage my project, even a J hook doesn't quite get me 7 bean stitches equaling 4 inches( try making 7 bean stitches with something close to an H hook and see if u get 4 inches lol), but it does get me a much longer starting chain than 28 inches lol I know I could just do less chains and bump up yet another hook size because the whole project is bean stitches. But I bet it just wouldn't look as pretty as the one online. Something has to be wrong with the way I'm crocheting or something. I just feel like the size of my beans vs how spaced apart they are.... (or maybe some other thing) would look bad. Not professional you know? I know it's a complicated question to tackle. But it's a free pattern. Easily accessible. https://www.ravelry.com/projects/pflaume/spring-bean-cowl I will post a picture of what mine keeps on coming up looking like. I did just unravel tho so I will have to make it again. Hopefully I figure something out this time. Sorry this is so long btw. And thank you for any help or tips/ ideas. An h hook only gets me to 7 beans equals 2 inches? J hook 3 inches. I sincerely doubt my guage is that different than hers. And it's a size 3 yarn too. A j or k hook seems a bit large for a size 3 yarn, but idk, I'm new to all this. I need help with this pattern posted free on this site https://www.free-crochet.com/detail.html?code=FC00415&source=pntrsta I have trouble with the joining of the squares instructions. I have just started this pattern, and I have made 2 motifs. Can't seem to understand how to join them and get the "X's" right. The square is easy, but having problems joining the squares. I don't know if you finish off both squares, or work to the joining rnd on rnd 11 and then try to join it them. Either way I have tried both ways and it seems impossible even though I know there is a way...but how? This is what I cam up with, but I don't like it. I am going to frog it, and start over with granny square instructions. I sure do appreciate her help, too! Hi, I’m new to this and New to crochet with patterns. I’m making a bunny for my nephews funeral so want to get this right. However, I’m stuck! I’m stitching double stitches in the round, and I’m fine with the pattern increases when it’s 2dc or less, but I’m not sure how to interpret it. I’m currently on round 8(finishing with 30sts), about to start round 9. But I’ve already done this on the body and this is where it started to lose shape so thought I would ask! most rows increase by 6, but it’s the bit that follows that confuses me, if some one can translate this to English for a beginner I’d be so grateful! Round 9: *inc,4dc, repeat from * to end (36sts) how do I do this?!! I’m trying to do the pattern sunburst pullover and I’m stuck on the rnd 7 that says to 7dc [dc,hdc,dc,tr,tr] all in one space. When I do that it’s to much when I do the next round it ruffles up. Am I doing it right is all of that in one space? Hello, I am a newbie here. I came across an instruction that really confuses me. It says "Make 4 chain (double chain with a single chain)." and I cannot for the life of me figure out what this means. Is this just a double crochet stitch? Thanks in advance for your help. Ive been worried about this all thru my project and I can't find an answer anywhere because I have a pretty specific question. 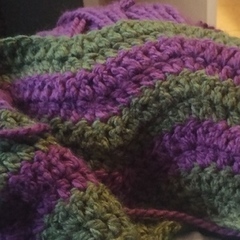 I'm doing a blanket in squares. I know that getting all the squares to the same size is very important. But I absolutely cannot get all my squares to be exact. Some are a quarter inch smaller than they should be. Will that make my project look bad once it's put together? I did it in acrylic yarn. All my squares are supposed to be 8 by 8. But some are 8 by 8 or 7 and 3/4 by 8 and Visa versa, or even 7 and 3/4 by 7and 3/4. Is that to much variation? Hi!! I need help! I found a slipper sock pattern that i love. I made some for my daughter whose 18 months.. my problem is my husband liked them too.. how do i make something almost triple the size?? Like is there a formula or do i just kinda wing it? Hes got huge feet and all the patterns ive found for mens slippers we dont like. I also have a question myself, if someone could help. I'm working with a sweater pattern, and when I reached the end of my first row (using double crochet), it says, chain 3 turn 3, then continues on with the pattern for that row. So my question is, what does turn three mean? Nothing I can find on the internet is helping. From this: "repeat ** until the end of the row sk 3 , 1dc, ch 3 turn 3. Ch5, 1sc in the first ch space,"
Hey everyone! So I need some help understanding this pattern. This pattern isn't written very well and I've worked through figuring it out up to now but I think my brain is fried and I can't figure this out. Im making a hooded batman cape for a toddler and am stuck on the hat. I've increased up until row 7 and am stuck on row 8 (see picture of pattern). I don't understand what the writer of the pattern means by "SC in each single crochet around increasing 6 (16 for toddler) evenly spaced single crochet for a total of 50 (60 single crochets made)." I'm making this for a toddler and that "16" is confusing me. Can anyone help me with this? I've emailed the woman who made the pattern but haven't heard back yet and I'm in a time crunch :/ Thank you in advance! Anna Here are the previous rows 6-9 written out (row8 is where I'm having problems): "Row6: Sc in each of the 40 sc around. Row7: Sc in each of the next 7 sc, make 2 sc in next sc around. (44 sc) note: do not make last sc increase on this round. Just sc in the last stitch. Row8: sc in each sc around increasing by 6 (16 for toddler) evenly spaced sc for a total of 50 (60 sc made). Row9-18: (9-20 for toddler): chain 1, sc in eCh of the 50 (60 for toddler) sc around.